Windsor, Ontario. August 3, 2018. 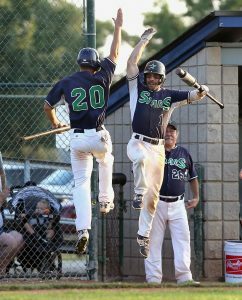 Windsor Stars Jake Lumley, left, celebrates with teammate Anthony Dufour after Lumley scored in the first inning against Tecumseh Thunder in Ontario Senior Elimination Tournament at Cullen Field August 3, 2018. See Parker story. Photo by Nick Brancaccio, Windsor Star.